Unconcerned about potential wear and tear on his arm, a Cardinals starter pitched a nine-inning no-hitter in a spring exhibition. 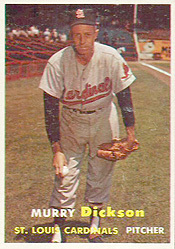 Using a knuckleball, curve and slider, Murry Dickson became the second major-league pitcher to produce a nine-inning no-hitter in a spring training game. He baffled the Yankees in a 7-0 Cardinals victory on March 30, 1948, before 1,948 at Al Lang Field in St. Petersburg, Fla.
Dickson received slugging support from a pair of Cardinals icons, Stan Musial and Red Schoendienst. Musial hit a three-run inside-the-park home run. Schoendienst delivered a three-run double. Cardinals manager Eddie Dyer told The Sporting News he had intended to pitch Dickson for six innings. After Dickson pitched a hitless seventh, Dyer gave his approval for Dickson to pitch the eighth and the ninth. Dyer received criticism for stretching Dickson, 31, in an exhibition game. National League president Ford Frick looked into the matter and was told by Dickson that he wanted to test his arm by pitching nine innings. Dickson struck out six, hit a batter and walked five (including center fielder Joe DiMaggio twice). He faced 30 batters. The Yankees hit into three double plays and stranded three runners. DiMaggio smoked a line drive “straight at shortstop Tommy Glaviano” for the hardest-hit out, according to the Associated Press. DiMaggio and shortstop Phil Rizzuto were two future Hall of Fame players in the Yankees lineup that day. In the ninth, Dickson got second baseman Lonny Frey to fly out to center and right fielder Ed Stewart to line out to second. Left fielder Johnny Lindell then flied out to center for the final out. Facing sore-armed Bill Bevens, the Cardinals scored all seven runs in the first inning. After Schoendienst walked and Erv Dusak singled, Musial “drove a pitch to the 450-foot sign in the right-center field corner and raced around the paths for an inside-the-park home run,” reported the St. Petersburg Times. Dickson drove in the fourth run on a bases-loaded walk and Schoendienst, batting for the second time in the inning, followed with a bases-clearing double. The hot start wasn’t sustainable. Dickson went 1-5 in July, finished 12-16 with a 4.14 ERA and was sent to the Pirates after the season.